In these uncertain times, we long for stability. We crave comfort. We want reassurance. What we need, dang it, is pudding. Bradley Ogden’s butterscotch pudding, to be precise. It’s a taste of nostalgia, of a better era, of more flush times. It’s a sweet, creamy spoonful that goes down ever so easily, unlike each morning’s painful headlines. And it’s got a touch of real booze in it. How many of us couldn’t use a bit of a buzz these days to calm our anxieties, right? This classic dessert, that’s thick as all get out, and a real mouthful of butterscotch flavor, can be found on the dessert menus of the various Lark Creek Restaurant Group establishments, of which Ogden is a founder. In the original recipe by Ogden’s mom, the pudding is baked in individual ramekins in a water bath. The restaurants make their pudding in one large pan in a water bath, then strain the baked pudding through a chinoise, before serving it in tulip glasses. By straining the pudding, you get rid of the thin, darker skin that forms on the pudding after baking. It also results in a pudding that’s a little less dense in texture. Since the skin doesn’t bother me, and because I like the pudding at its very thickest, I cook mine with the individual ramekin method sans sieving post-baking. 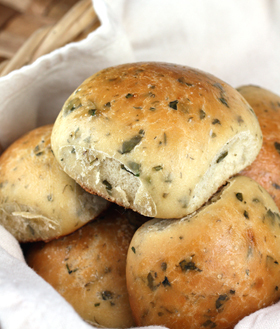 It’s the way Ogden’s mom made it, and the way he prefers it, too. 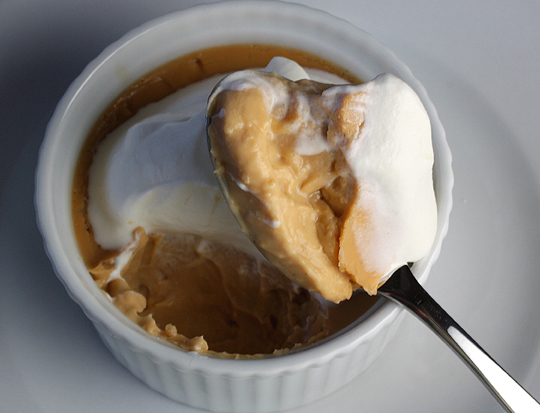 Make a batch of this awesome butterscotch pudding, and welcome 2009 with a sure thing. The pudding needs to be made a day ahead of serving, as it needs time to chill and set up in the refrigerator. Covered with foil, the pudding will keep in the refrigerator for about 3 days. Preheat oven to 325 degrees. Boil a full tea kettle of water; set aside. Put 3 1/2 cups heavy cream and the vanilla bean and its seeds in a large, heavy saucepan. Bring to a boil, take off heat and whisk in butterscotch chips until blended smoothly. Place egg yolks in a large bowl and whisk well. Slowly add hot cream mixture while whisking vigorously. Set aside. In a small, deep, heavy saucepan, combine brown sugar and water over high heat. When sugar dissolves and caramelizes, carefully add scotch and remaining 1/2 cup cream. Continue cooking, stirring well, until mixture is smooth and slightly thick, about 3 minutes. Whisk this caramel mixture into butterscotch mixture. Strain mixture through a fine sieve. Divide among 12 (4-ounce) ramekins. Place ramekins in a large roasting pan. Place pan on oven rack, then carefully pour tea kettle of hot water into roasting pan, taking care not to splash into ramekins. Water should come halfway up the sides of ramekins. Carefully slide roasting pan into oven. Bake for 50 minutes until puddings are set but still a little wiggly. Transfer ramekins to a rack or cookie sheet to cool for about 30 minutes. Then refrigerate, loosely covered with foil, overnight. 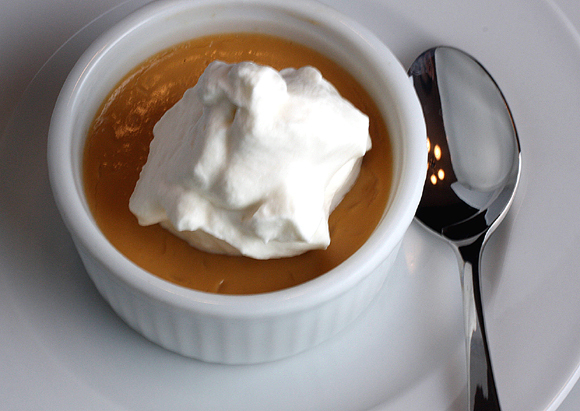 Serve puddings with a dollop of unsweetened or lightly sweetened whipped cream. Or serve them brulee style by sprinkling the tops with a little granulated sugar, then caramelizing them with a blow torch.